View More In Micro SD Cards - Page 2. Our Canada LakeVü HD and Canada LakeVü HD Ultra products feature over 13,500 lakes with detailed depth information. Includes provinces of Alberta, British Columbia, Nova Scotia, Ontario, Quebec, Saskatchewan, and Yukon provinces. It also includes detailed coverage of the Great Lakes and Trent Severn Waterway and other border lakes/rivers. Of these lakes, over 1600 offer HD coverage with 1' contours shoreline to shoreline. 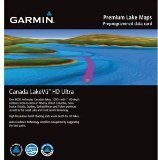 Auto Guidance (1600+ HD Lakes) - A Garmin exclusive, Auto Guidance directs you to your hot spots quickly by instantly creating an on-screen path for your boat to follow that avoids shallow water and other charted obstructions. Shown with Mariner Eye view. High Resolution Relief Shading adds visual depth to the 2-D map making it easier to interpret contours and find fish holding structure. Dynamic Lake Level (1600+ HD Lakes) - Allows you to adjust your maps to the lake's current water levels giving you a better idea of spots that are either accessible or too shallow to explore. Fisheye View (1600+ HD Lakes) - Underwater perspective shows 3-D representation of lake bottom and contours as seen from below the waterline. Interface with sonar data for customized view.